← Dr. Donald Whitney: Why Join A Church? Estimates from some church experts (e.g. Ed Stetzer) on the state of churches in America say that approximately 4,000 churches close their doors every year. This book is the story of a one time mega church in downtown Kansas City that began in the 1800’s and how it was in danger of dying in the early 2,000’s and how it was turned around into a thriving church again. It’s a good story of how “cartel’s” work to bring about paralysis and decline in churches (lots of churches have these types of cartels) and how an interim pastor (Mark Devine – a professor at Midwestern Seminary) had the wisdom and wherewithal to weather the storm and in God’s good providence see a positive outcome for this particular church – with the help of another mega church from St.Louis led by Darrin Patrick (author of Church Planter and For The City). 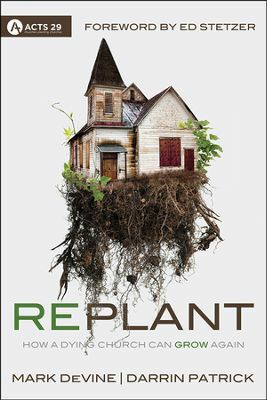 The book isn’t really a handbook or manual on “how to” replant a church, so much as it is just the story of how two churches came together to save a dying a church. It is a story of God’s grace and providence in bringing together the right people at the right place at just the right time to make a big difference in Kansas City. I think it’s a wonderful story that I hope will “play out” in different venues around the world. If there are any principles to be gleaned from the book it would be the following: (1) The importance of a shared vision among the leadership team; (2) The importance of wise and godly leaders praying fervently for their local church; (3) The importance of being flexible and willing to change as a church (not changing the gospel – but changing forms and functions for the sake of the gospel); (4) The importance of cooperating with the greater body of Christ and taking risks for the sake of Christ’s Church (that it’s something worth risking for!). I recommend this book especially for leaders that are in churches that have plateaued or are in decline. It will give you some ideas, warnings, red flags to watch for, and will also encourage you by giving you some positive steps to glean from in the St.Louis and Kansas City connection. There is not just one way to “replant” a church, but it will encourage you to know that God loves His Church and the gates of Hell will not prevail against it. My hope is that God will use this book to motivate, encourage, and give ideas to struggling churches and that they will thrive once again for His glory and His Kingdom!